Packing List: Bring a water bottle, layered clothing appropriate for changing weather, closed toed shoes, comfortable/stretchy pants, a rain coat, and sunscreen. 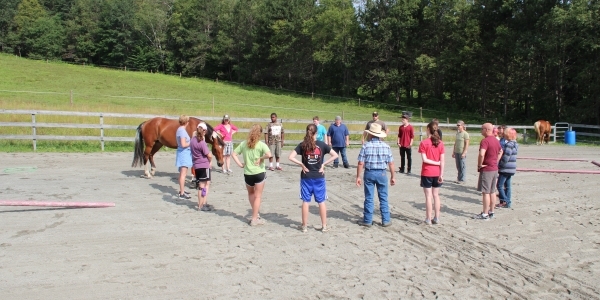 Come discover creative play with horses in a safe, family-style environment at MoonRise Farm. We will be working with the horses in the barn, pasture, ring, round pen, and the “horse playground.” Yoga, gymnastics/vaulting, and mindfulness both on and off the horse will be integrated with related group games and arts activities. As you engage in the creative arts and learn how to connect with, care for, and become the leader of your horse, you will also forge new connections with yourself and your friends, building resiliency that can help you at home and in school. Participants will receive registration paperwork in advance of the class that must be completed and submitted to ArtisTree by April 17. Drop-off and pick-up are at MoonRise Farm in Taftsville, VT. For directions, please visit their website [https://moonrisefarm.org/directions-to-moonrise-farm] Packing List: Bring a water bottle, layered clothing appropriate for changing weather, closed toed shoes, comfortable/stretchy pants, a rain coat, and sunscreen. D.J. Jesser has been running a therapeutic equine program developed in collaboration with Vermont Adaptive Ski and Sports for the past 16 years. As a psychotherapist, she offers over 30 years experience counseling individuals and families as well as developing and implementing therapeutic experiential programs for schools and community organizations. Her passions include family, friends, outdoor adventures of all kinds, dancing, social and environmental justice, yoga, prayer, and meditation. Ben Fox, LCMHC, ArtisTree Art Educator & Coordinator, is a local expressive arts therapist with a long and diverse history of art and trades experience. A stained glass artisan in his youth, Ben sought further arts education at RISD and the Pilchuck School of Glass. Ben has a Master of Arts in Expressive Therapies and a B.A. in Studio Art from Hamilton College. He has taught and worked in various creative fields such as making outdoor clothing and bags, fine woodworking, photography, and lately outdoor sculpture.